434 pages | 86 B/W Illus. Climate is a soil-forming factor and soil can mitigate climate change through a reduction in the emissions of greenhouse gases and sequestration of atmospheric CO2. Thus, there is a growing interest in soil management practices capable of mitigating climate change and enhancing environmental quality. Soil and Climate addresses global issues through soil management and outlines strategies for advancing Sustainable Development Goals (SDGs). 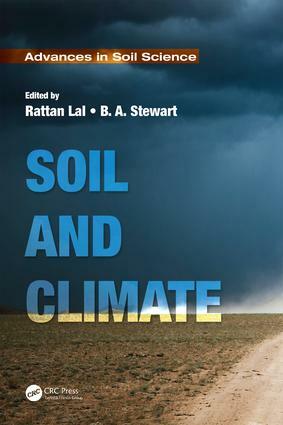 Special topics on soil as a source or sink of CO2, silicate weathering and carbon sequestration, nutrients required for carbon sequestration, physical protection and the mean resident time, and predicting soil carbon stocks are discussed in detail throughout the book. Spoil and Climate. Soil--The Hidden Part of Climate: Microbial Processes Regulating Soil-Atmosphere Exchange of Greenhouse Gases. Regionally Diverse Land-Use Driven Feedbacks from Soils to the Climate System. Conservation Agriculture: Maintaining Land Productivity and Health by Managing Carbon Flows. Nutrient Requirements for Soil Carbon Sequestration. Physical Protection and Mean Residence Time of Soil Carbon. Nitrogen Cycling and Dynamics in Terrestrial Ecosystems. Biochar for Climate Change Mitigation: Navigating from Science to Evidence-Based Policy. Silicate Weathering to Mitigate Climate Change. Determination of Secondary Carbonates. Effects of Plant Invasions on the Soil Carbon Storage in the Light of Climate Change. Climate Change Impact on Soil Carbon Stocks in India. Soil Degradation and Climate Change in South Asia. The Soil-Livestock-Climate Nexus. Soil and Human Health in a Changing Climate. Climate Change and the Global Soil Carbon Stocks. Rattan Lal, PhD, is a Distinguished University Professor of Soil Science and Director of the Carbon Management and Sequestration Center, The Ohio State University, and an Adjunct Professor of University of Iceland. His current research focus is on climate-resilient agriculture, soil carbon sequestration, sustainable intensification, enhancing use efficiency of agroecosystems, and sustainable management of soil resources of the tropics. He received honorary degree of Doctor of Science from Punjab Agricultural University (2001), the Norwegian University of Life Sciences, Aas (2005), and Alecu Russo Balti State University, Moldova (2010). He was president of the World Association of the Soil and Water Conservation (1987-1990), the International Soil Tillage Research Organization (1988-91), the Soil Science Society of America (2005-2007), and is President Elect of International Union of Soil Science. He was a member of the Federal Advisory Committee on U.S. National Assessment of Climate Change-NCADAC (2010-2013), member of the SERDP Scientific Advisory Board of the US-DOE (2011-), Senior Science Advisor to the Global Soil Forum of Institute for Advanced Sustainability Studies, Potsdam, Germany (2010-), member of the Advisory Board of Joint Program Initiative of Agriculture, Food Security and Climate Change (FACCE-JPI) of the European Union (2013-), and Chair of the Advisory Board of Institute for Integrated Management of Material Fluxes and Resources of the United Nation University (UNU-FLORES), Dresden, Germany (2014-2017). Prof. Lal was a lead author of IPCC (1998-2000). B.A. Stewart, PhD, is Director of the Dryland Agriculture Institute and a distinguished professor of soil science at West Texas A&M University, Canyon, Texas. He is a former director of the USDA Conservation and Production Laboratory at Bushland, Texas; past president of the Soil Science Society of America; and member of the 1990-1993 Committee on Long-Range Soil and Water Policy, National Research Council, National Academy of Sciences. He is a fellow on the Soil Science Society of America, American Society of Agronomy, Soil and Water Conservation Society, a recipient of the USDA Superior Service Award, a recipient of the Hugh Hammond Bennett Award of the Soil and Water Conservation Society, an honorary member of the International Union of Soil Sciences in 2008. In 2009, Dr. Stewart was inducted into the USDA Agriculture Research Service Science Hall of Fame . Dr. Stewart is very supportive of education and research on dryland agriculture. The B.A. and Jane Ann Stewart Dryland Agriculture Scholarship Fund was established in West Texas A&M University in 1994 to provide scholarships for undergraduate and graduate students with a demonstrated interest in dryland agriculture. Scholarship Fund was established in West Texas A&M University in 1994 to provide scholarship for undergraduate and graduate students with a demonstrated interest in dryland agriculture.